CarGurus has 114,320 nationwide Escape listings starting at $1,250. When planting the gas pedal from a dead stop, there was a slightly delayed response, but in normal driving the lack of lag made it easy to forget there was a turbo under the hood. Twelve years ago, SUVs remained popular, crossovers were virtually unheard of, and car companies were attempting to keep a straight face while presenting 4-wheeled atrocities such as the Pontiac Aztek. The market was ripe for the all-new Ford Escape, a ruggedly boxy rig that wasn’t as big and thirsty as a Chevy Suburban. In the years since, the number of quality competitors has nearly doubled, prompting the debut of the redesigned 2013 Ford Escape, a European-inspired crossover delivering bold styling, modern powertrains and a bounty of technology. For 2013, Ford gambled the Escape’s future success by debuting an all-new model, which is essentially an American-ized version of the Ford Kuga that’s been sold overseas since 2008. Though it shares underpinnings with the Ford Focus and C-Max hybrid, the 2013 Escape stands apart thanks to sleek styling that marks a dramatic shift from its more utilitarian predecessor. Gone are the upright grille and square body, replaced by a swept-back front end, sharp crease lines on the body and a sloping rear roofline. During my test drive, most observers gave the design a nod of approval, but some owners of the 2001-2012 models suggested the vehicle had lost the rugged character they favored. 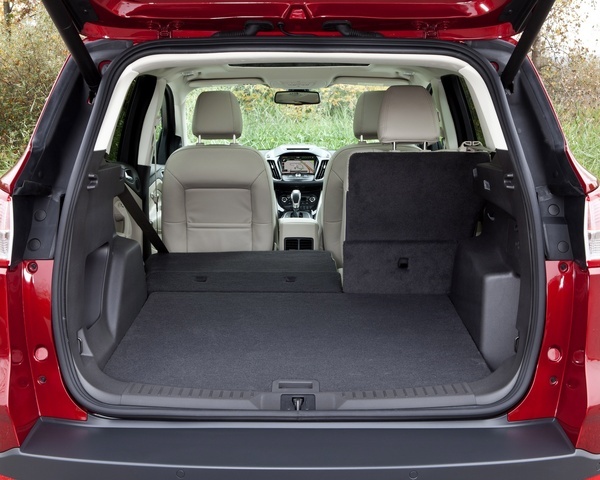 Compared to the outgoing example, the 2013 Escape’s exterior dimensions and cargo space are greater, whereas most interior measurements are smaller. 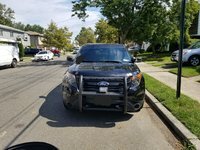 I spent a week with a front-wheel-drive 2013 Ford Escape SE equipped with an optional power moonroof, power tailgate, and SYNC with MyFord Touch system. Among the SE’s more notable standard features are a turbocharged EcoBoost engine, a 6-month complimentary subscription for SiriusXM satellite radio service, a height-adjustable driver’s seat, 17-inch alloy wheels and a programmable MyKey system that allows limits to be placed on vehicle speed, audio volume and more. The window sticker read $29,025. Shoppers interested in the 2013 Escape can also select a base S model, priced from $23,365 and lacking the SE’s satellite radio and turbocharged engine. One step above the SE is the Escape SEL, home to upgrades such as leather upholstery, heated front seats, and dual-zone climate control. The top-of-the-line 2013 Escape Titanium, topping out at about $38,000 fully loaded, adds push-button start, Ford’s foot-activated power tailgate, a Sony sound system and more. Like its styling, the Ford Escape’s powertrain lineup has been heavily revised for 2013. In fact, the only common link between the new and previous-generation models is a 2.5-liter 4-cylinder engine pumping out 168 hp and 170 lb-ft of torque. Fuel economy is estimated to average 22 mpg city/31 highway. At the other end of the spectrum is the 2013 Escape’s available 2.0-liter, turbocharged 4-cylinder EcoBoost engine, boasting 240 hp and 270 lb-ft of torque. According to the EPA, drivers can expect up to 22 mpg city/30 highway. Also new for 2013 is the zippy 1.6-liter, 4-cylinder turbocharged EcoBoost engine that powered my test car. Output measures 178 hp and 184 lb-ft of torque, with front-wheel-drive fuel economy coming in at 23 mpg city/33 mpg highway. Every 2013 Escape features a standard 6-speed automatic transmission with a Sport mode. Regular 87-octane gasoline is recommended, though the EcoBoost engines deliver peak performance when running on a liquid diet of premium-grade fuel. After hundreds of miles, including a good bit of travel on Interstate 95, my lead foot and I recorded an average of 24.1 mpg. As is the case with other EcoBoosted models like the F-150 and Ford Edge, my 2013 Escape test vehicle impressed with its smooth and refined power delivery; when planting the gas pedal from a dead stop, there was a slightly delayed response, but in normal driving the lack of lag made it easy to forget there was a turbo under the hood. In city driving, the middle child of the Escape’s engine family allowed me to scoot through traffic without worry and, on the highway, I had no concerns about merging into the fast-moving passing lane. Much of the credit goes to the automatic transmission’s response to throttle input, especially when shifted into sport mode. There’s also a manual shift feature activated by tapping a button on the side of the gear lever—this awkward placement led me to avoid using it. In terms of handling, engineers struck a favorable balance, providing a comfortable ride that isn’t unsettled by bumps and offers plenty of capability for tackling twisty back roads. That’s due in part to what Ford calls torque vectoring control, a system designed to improve cornering capability and minimize understeer by delivering more power (read: grip) to the inside wheel. While I didn’t barrel into curves at insane speeds, I pushed the limits enough to determine that Ford has built a small crossover that’s genuinely fun to drive. At 5’8” tall and with a build that reflects an occasional Dunkin’ Donuts indulgence, I’m not a particularly big guy. Even so, the redesigned Escape’s bolstered, narrow front bucket had me feeling squeezed, a point further aggravated by limited legroom and the need to rest my knees against mostly hard surfaces on the door and center console. In this instance, Ford has not thrown out the welcome mat for lanky and less svelte individuals. However, I spent hours behind the Escape’s small, sporty tilt/telescoping steering wheel and came to appreciate the padded armrests and quiet cabin. Most importantly, I didn’t feel fatigued after long drives. Rear-seat passengers are afforded greater legroom, but the lower cushions are flat and lack thigh support. 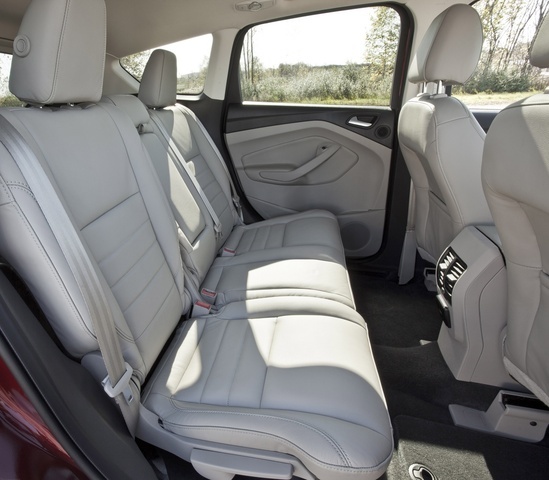 On the plus side, the doors open wide for easy access, headroom is plentiful, the optional panoramic roof adds a sense of spaciousness, rear vents on the console provide an extra degree of comfort, and a fold-down center armrest serves double-duty with its 2 integrated cupholders. Other storage provisions include seatback and door pockets, another 4 cupholders up front, and a few cubbies. Ford does offer a new foot-activated power tailgate on SEL and Titanium models; the SE can be equipped with the more common version using buttons on the keyless remote and instrument panel. When opened, the tailgate unveils a large opening with a low liftover that’s good for loading bulky items; folding the rear seats creates a flat load floor and 68.1 cubic feet of space. That’s less than you’ll get with the Honda CR-V (70.9) and redesigned Toyota RAV4 (73.4), but more than the Chevrolet Equinox (63.7). What you won’t find in competitors like the CR-V is the new Escape’s ultra-modern interior design, accented by lots of angles and a mix of finishes. I found the look busy and likely to cause sensory overload, but Ford deserves props for the soft-touch dash, mesh headliner and rubber grips on the instrument panel’s primary dials. 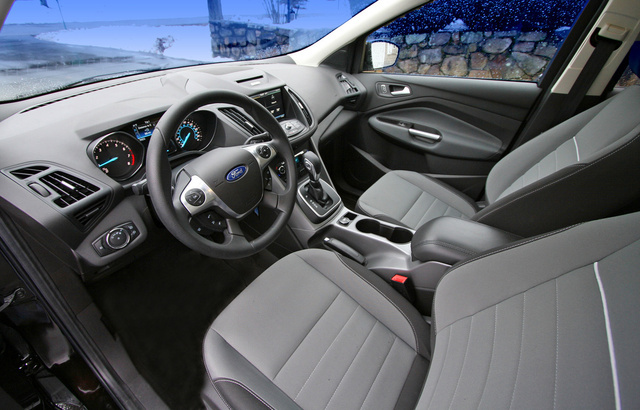 The SYNC with MyFord Touch infotainment system has gathered its share of critics, but the updated version in models like the 2013 Ford Escape has been enjoying more positive press. After a week using the technology in my test car, I can understand the appeal from the connected crowd, as well as the grumblings from reluctant adaptors. On the surface, the system appears mind-numbingly simple, with an ample touchscreen and intuitive commands that direct the user to entertainment, climate, navigation and phone functions. In reality, I found myself forced to tap multiple times to execute basic tasks such as scanning through satellite radio stations. Unfortunately, unlike traditional controls, you can’t “learn” the placement of icons on a touchscreen. Buyers who want to stick with what they’re accustomed to will appreciate the Escape’s supplemental buttons and dials for the audio and climate control systems, though some of the latter are a bit difficult to use when the shift lever is placed in Park. Adjustments can also be made via SYNC’s voice-activation feature, functionality that extends to paired phones or other devices plugged into one of the two USB ports (an SD card slot is also included). Text-to-speech technology allows SYNC to read incoming text messages aloud, and for those times when you need web access on the road, a Wi-Fi hotspot can be set up between SYNC and your Bluetooth-enabled smartphone. In crash tests conducted by the National Highway Traffic Safety Administration (NHTSA), the 2013 Ford Escape earned an overall rating of 4 (out of 5) stars. The Insurance Institute for Highway Safety (IIHS) also tested the vehicle and subsequently named it a 2013 Top Safety Pick. Contributing to such results are 7 airbags complemented by a stability and traction control system as well as 4-wheel antilock disc brakes with electronic brake assist. Impressive as those factors are, they don’t necessarily translate to a feeling of safety when seated behind the steering wheel. For me, that came from the Escape’s raised driving position and wide-angle exterior mirrors, which provided a helpful view of blind spots. Less laudable were the wide rear pillars and large rear head restraints. Compared to direct competitors such as the 2013 Chevrolet Equinox, 2013 Honda CR-V and 2013 Toyota RAV4, the all-new Ford Escape leads the pack with the lowest base price, 3 engine options, the most efficient pairing of power and all-wheel-drive capability (up to 28 mpg with the 2.0-liter EcoBoost; the Equinox’s optional V6, with more horsepower but less torque, delivers up to 23 mpg), and the broadest availability of technology like SYNC with MyFord Touch. 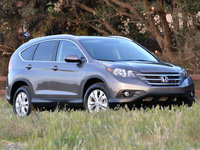 However, the CR-V offers more cargo space and a better overall NHTSA crash-test rating, while the Equinox shines with up to 32 mpg from its 4-cylinder engine and the longest powertrain warranty of the bunch. Complaints associated with the MyFord Touch system have contributed to sharp drops in Ford’s owner satisfaction ratings, but the updates for 2013 may right that ship. The Escape, specifically, has recorded average reliability; early indications for the 2013 model suggest that trend will continue. 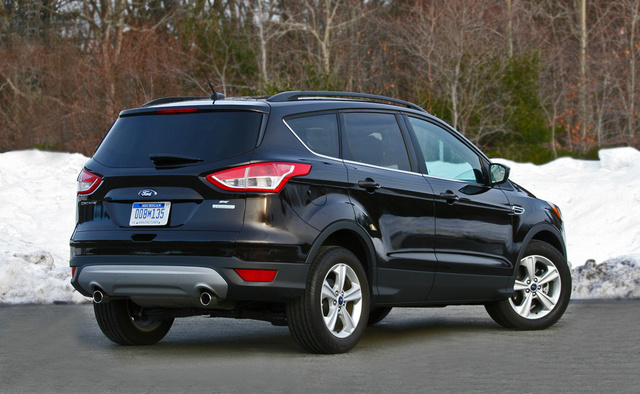 What's your take on the 2013 Ford Escape? DanOg The ignition key is a constant sore point- can't see it behind the clustered steering wheel controls, then Ford opted to make the entry surface flat instead of slightly funnel shaped to guide the key. To top it off surrounding the metal key entry area is a gap just big enough for the key to stick in. Did anybody at Ford actually drive one of these before production? Why did Ford put the gas filler on the "wrong" side? Most vehicles have it on the driver's side...not the Escape. Overall pleased with the Escape, just pointing out two little nuisances that would have cost nothing to fix in the design stage. DanOg Oh yeah one other oddity- since there a NO manual door lock controls inside let me create a scenario- say you have an electrical system issue that drains the battery and are forced to leave the car, perhaps on the side of the road. You CANNOT lock the doors! Stupid design. LTH This is your biggest gripe is the key? American cars are typically on the right side anyway, while imports are traditionally on the left. GuruX21VG lack of light in cargo area,light to small. 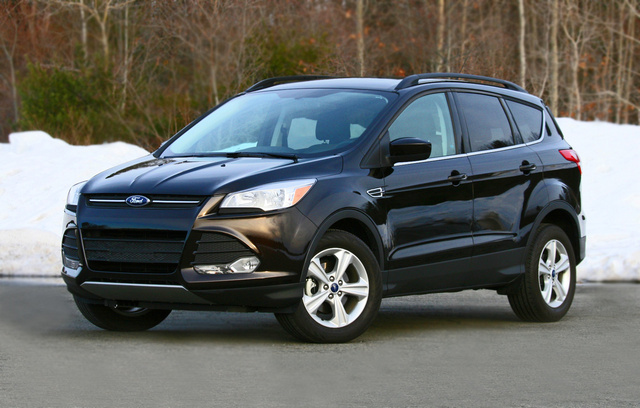 Users ranked 2013 Ford Escape against other cars which they drove/owned. Each ranking was based on 9 categories. Here is the summary of top rankings. 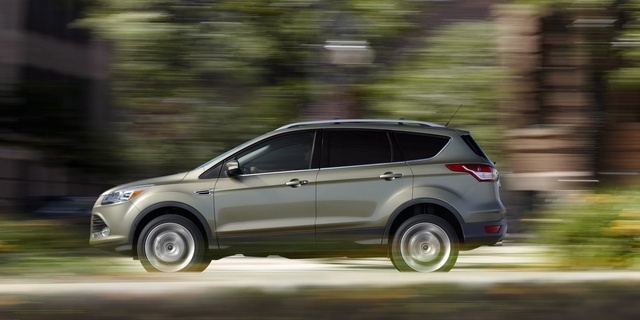 Have you driven a 2013 Ford Escape? Just changed oil now how do i reset? How Do I Use The Keyless Entry Pad? Just replaced the battery on a 2013 Ford Escape. Now the car won't start. All the lights appear to be normal. Anyone know what's the issue? My Rear Passenger Side Door Will Not Latch And Stay Closed, Any Ideas? Is there away to open car and start engine if the battery dies in my fob?